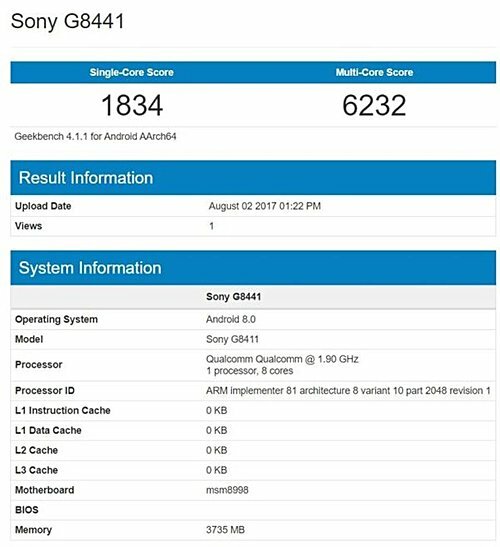 A new Sony smartphone has surfaced on Geekbench. 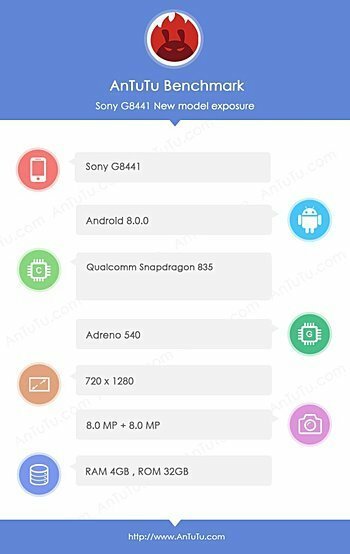 Listed as Sony G8441, the device is powered by Snapdragon 835 SoC, packs in 4GB RAM, and runs Android 8.0. The handset was also spotted in a AnTuTu listing a few weeks ago, revealing 32GB storage, 720p display resolution, and 8MP/8MP camera combo. Now, the Xperia XZ1 also features Snapdragon 835 SoC and 4GB RAM, but has a Full HD resolution (display size is 5.2-inch). Moreover, it is identified as G8341, so the G8441 is likely a different device. Digging deeper, a rumor from May this year said the Xperia XZ1 Compact will also be powered by Snapdragon 835 SoC and come with 4GB RAM. Just that it’ll have a smaller display: 4.6-inch. So it’s highly likely that the G8441 is the Xperia XZ1 Compact. The device is said to pack in a 2,800mAh battery.